Today marks the 33rd anniversary of the Space Shuttle Challenger disaster which occurred on January 28, 1986, when the NASA Space Shuttle orbiter Challenger (mission STS-51-L) broke apart 73 seconds into its flight leading to the deaths of its seven crew members. STS-51-L was the 25th American Space Shuttle Program flight since the program began in 1981. It was also the first mission to have a civilian on board, American teacher Christa McAuliffe. The spacecraft disintegrated over the Atlantic Ocean, off the coast of Cape Canaveral, Florida at 11:39 EST (16:39 UTC). According to the Report of the Presidential Commission on the Space Shuttle Challenger Accident, weather conditions were likely one of the factors that contributed to the incident. Tests conducted during the subsequent investigation showed that O-rings were much less resilient at lower temperatures, but the extreme cold at the Kennedy Space Center was not the only weather factor involved with this tragedy. Challenger's launch had originally been scheduled for the afternoon of January 22nd. After a two-day slip related to the previous shuttle mission, bad weather at an emergency landing site in Senegal and problems with an alternate site in Morocco delayed the launch to Sunday, January 26th. Air Force weather forecasters provided a pessimistic Sunday forecast to NASA managers the night before, causing managers to postpone Sunday's launch in advance. However, as it turned out, the weather was fine on that Sunday morning leading launch director Gene Thomas to say "Sunday morning, the weather was perfect. We got a bad report. It happens." The countdown then proceeded towards a launch on Monday, January 27th at 9:37 a.m. After the crew boarded Challenger, a tool used to close the hatch became stuck. The ground crew eventually removed the tool, but by that time crosswinds at the Shuttle Landing Facility rose above the acceptable limit for a Return-To-Launch-Site (RTLS) emergency landing. At 12:35 p.m., the launch was scrubbed for January 27th and rescheduled for Tuesday, January 28th at 9:38 a.m.
After Monday's scrub, weather forecasters briefed managers on the outlook for Tuesday morning, January 28th. Clear skies were forecast, but unseasonably cold weather was expected to sweep through central Florida. The minimum predicted air temperature at the launch pad bottomed out at 22°F for the hours just before dawn on Tuesday, January 28th. With sub-freezing temperatures predicted, ground crews drained most of the water pipes at the launch pad to minimize ice formation. Those that could not be drained were left running overnight, and strong wind gusts blew water onto pad structures where it subsequently froze. The ice inspection team was sent to the launch pad several times overnight to evaluate conditions at the launch pad. Before each shuttle launch, the ice team would do a review of any potential ice buildup on the external tank caused by the supercooled liquid oxygen and hydrogen in the tank. 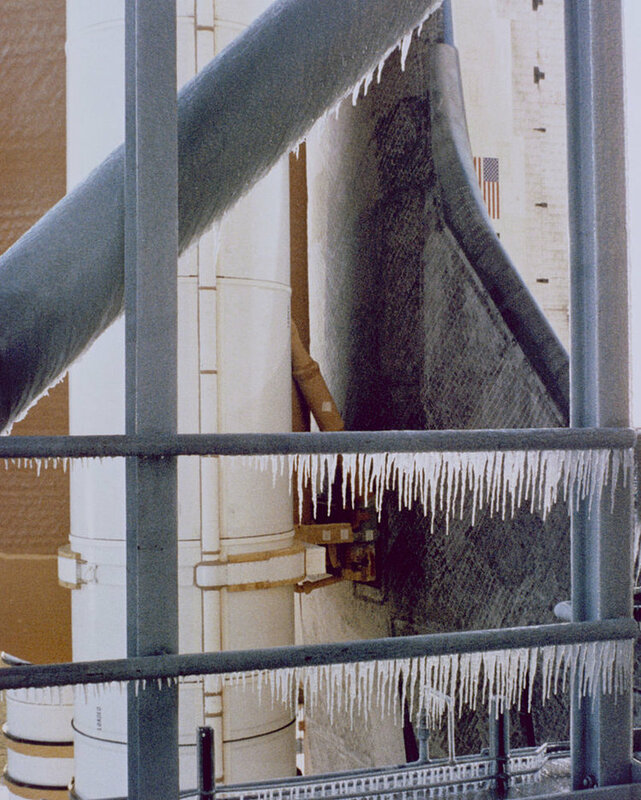 Ice on the tank and launch pad structure was considered a debris hazard because it could break off and damage the shuttle's fragile thermal protection tiles (i.e., heat shield). Upon seeing the amount of ice on the pad, the launch team decided to delay the launch to 11:38 a.m. in order to give the sun time to melt some of the ice and minimize the debris risk. There was indeed a widespread Arctic air outbreak in the eastern U.S. on that late January day in 1986 that pushed record-breaking cold air all the way down into central Florida. Arctic high pressure extended southward into the region during the overnight hours helping to contribute to the record-breaking cold (surface map above). Melbourne, Florida, located about 35 miles from Cape Canaveral, recorded a record low temperature of 26 degrees; the normal low on January 28th is 50 degrees. Likewise, Orlando also had a record low of 26 degrees that morning. Both records still stand, and both locations broke their record lows the following morning as well. As a result of cold and some gusty winds, ice accumulated on the launch pad area in the overnight hours. The ice was removed by crews, and multiple ice checks took place prior to launch. According to the investigation report, the ambient air temperature at the time of launch, 11:38 a.m. EST, was measured at 36 degrees. This measurement was made near ground level by a weather tower 1000 feet from the pad. However, the temperature near the failed Solid Rocket Booster joint – located at a higher altitude - was actually estimated to be 28°F. Not only was the ambient air near the Solid Rocket Booster joint colder than ground level measurements due to altitude differences, but the failed joint was shaded from the sun during the hours prior to liftoff. Joints on the sun-facing side were estimated to be nearly 20 degrees warmer than those on the shaded side at liftoff. Furthermore, the gusty winds created an enhanced cooling effect between the supercooled tank and the O-ring joint region. The wind barbs (circled region) on this sounding plot at Cape Kennedy on the morning of the launch featured a noticeable change of wind speed and wind direction with height. This wind shear was an important contributing factor to the Space Shuttle Challenger disaster. Map courtesy University of Wyoming. In addition to the extreme cold, wind shear (change of wind direction and speed with altitude) played a vital role in the Challenger disaster as it contributed to the failing of the O-rings on the Solid Rocket Booster. The first hint of trouble occurred at liftoff, but was not noticed until film was developed after the accident. Several puffs of smoke were seen emanating from the right Solid Rocket Booster aft field joint. Challenger encountered several bouts of wind shear (see sounding plot above) starting around 37 seconds into the flight and lasting through just after one minute after liftoff. About one minute after liftoff, a flame plume becomes visible on the right Solid Rocket Booster. The plume originates from around the aft field joint - the same area as the smoke puff seen at liftoff. The plume grew and was pushed by aerodynamic forces toward the external tank. The first evidence of external tank failure is the interaction of the plume with liquid hydrogen leaking from the external tank about 65 seconds into the flight. The plume also began to burn the strut connecting the right solid rocket booster and external tank. The tank structure failed approximately 73 seconds after liftoff, causing the liquid hydrogen and oxygen to vaporize with local combustion. Challenger itself did not explode, but was torn apart by extreme aerodynamic forces. Several large components of Challenger, including the right wing and crew compartment, are visible in photographs and film after the breakup. Tests conducted during the Rogers Commission investigation showed that O-rings were much less resilient at lower temperatures. As a result, they “would not be able to expand along with the Solid Rocket Boosters case motion, and may not seal the joint properly”. This is what happened with the sub-freezing O-rings in Challenger's right Solid Rocket Boosters aft field joint. The shuttle was designed to handle a certain amount of structural load with margin built in. During the shuttle's 8 1/2 minute ride to orbit, on-board computers steered the shuttle along a pre-planned trajectory. Before launch, upper level winds were typically monitored by series of balloons and other devices. Engineers used the wind data to optimize the shuttle's trajectory to minimize load caused by upper level winds. If the predicted structure load was outside of the acceptable limits, the launch would be scrubbed. In general, wind shear is more important for structural load than just the wind speed by itself. The structural loads seen during Challenger's ascent were among the largest in the history of the shuttle program. However, the Rogers Commission determined they were not outside of the design limits and therefore did not themselves cause the accident. Some experts believe, however, that the O-ring failure - and as a result the Challenger accident - would not have occurred without the high wind shear. On September 29th, 1988 - thirty-two months later - the Space Shuttle Discovery launched successfully with its five man crew and the United States had returned to flight.